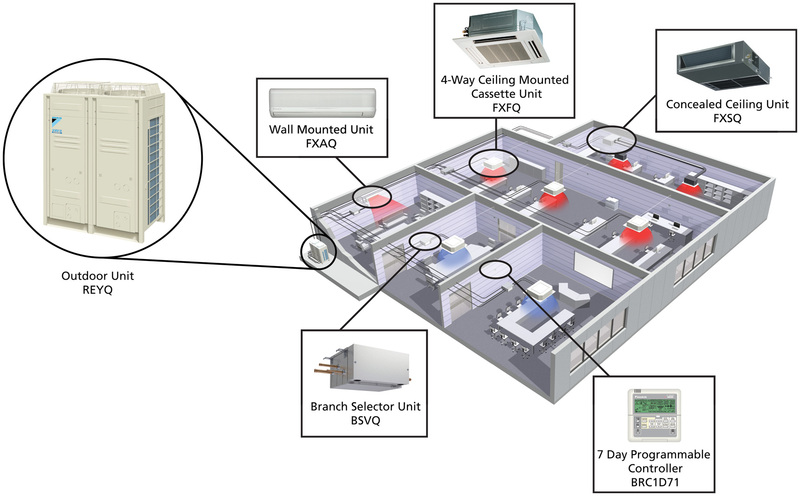 This article is targeted at air conditioning engineers and designers installing VRV air conditioning systems with ducted fan coil units. Air intelligence have recently completed a large project of this nature for a client in Beaconsfield (Berkshire). Although the installation itself was trouble free, achieving acceptable comfort levels for staff at the site has proved slightly problematic. With the air conditioning In ‘heating’ mode, the open plan areas were getting much to warm. With the air conditioning in ‘auto’ mode, members of staff where getting regular dumps of cold air. 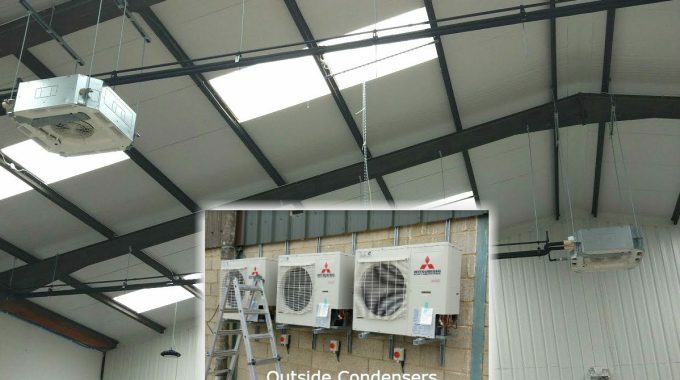 The air conditioning system in question consisted of two 64kw VRV outdoor units connected to around 30 indoor units. The equipment was by Mitsubishi Heavy Industries (MHI), but we have no reason to believe the issues we encountered would have been unique to this brand. We found that the top boxes on top of the ceiling grills were not getting a good enough seal and a lot if the warmed air was escaping into the ceiling void. This air was then being recycled into the FCUs to be heated further. The temperature in the ceiling void was reaching over 30oC. Replacement top boxes was required to resolve this problem. By default, the air conditioning FCU fans continued to run at a low level when the set point was reached. Also, the FCUs need to continue to allow a small amount of heated refrigerant into the coils. This was resulting in the FCUs continuing (be it at a low level) to provide heating when the set point was achieved. We understand the logic of doing this is to continue to feed fresh air into the room from the VAM fresh air units. However, to overcome this problem, it was necessary to configure the system to completely switch off the fan when the set point was reached. The downside of the above was that the fresh air from the VAM units was not being pumped through the air conditioning FCUs. Instead, it was filling the ceiling void and eventually dropping down through the return air grills onto staff below. It was necessary to locate these return air grills to positions away from staff. When moving the air conditioning return air grills, we made the mistake in some cases of relocating them to positions where the cooler air was dropping onto the controllers. Bearing in mind these controllers are also the temperatures sensors, they were no longer getting an accurate representation of the overall room temperature. When the air conditioning is in ‘auto’ mode, the system (by default) heats an area until it is 1oC above the set point. After which the heating is turned off. The cooling is only invoked if the actually temperature continues to rise a further 2oC. If this does happen, the cooling is then triggered and keeps cooling until the temperature is 1oC below the set point. After this point, the cooling is switched off. The heating will not be invoked until the temperature drops a further 2oC. This effectively creates a dead band of 6oC. In our case the set temperature was 22oC, but with the dead band, if varied between 19oC and 25oC, which was understandably unacceptable to the client. Firstly, this problem confirmed our general view that the air conditioning ‘auto’ mode is not particularly good at holding temperature and also causes cold drafts. We did reduce the number of times the system entered cooling by the actions in point 1 in the first section of this report. We found that the dead band could be configured. Rather than the temperature dropping 3oC below set point before invoking heating, we changed this to 1.5oC. We avoided changing the configuration when the temperature exceeded the set point by 3oC as this would have just increased the number of times cooling was invoked. We increased the static pressure setting in the controllers so that fan worked harder at all settings. This increase the air circulation and reduced stratification and cold spots in the areas. Despite all of the above, many areas still worked much better in ‘heating’ mode than they did in ‘Auto’ mode.